The MDS Master Stations, built upon our modular communications platform, are used with SD Series and x710 series remote radios. The MDS Master Stations support full duplex communication in a protected 1+1 warm standby transceiver configuration to provide reliability for continuous use, high duty cycle applications associated with licensed narrowband Base Station and Repeater applications. The MDS Master Station is offered in a 19 in/43.8 cm, 2 rack-unit high chassis containing an internal duplexer with options for connecting an external duplexer. GE's MDS SD Series and MDS x710 licensed narrowband communication networks are deployed to monitor, control and maintain critical processes and distributed assets. Users require high reliability and availability, driving demand for high duty cycle products that are capable of continuous operation and that minimize central points of network failure. The Master Station is built to meet these demanding requirements. 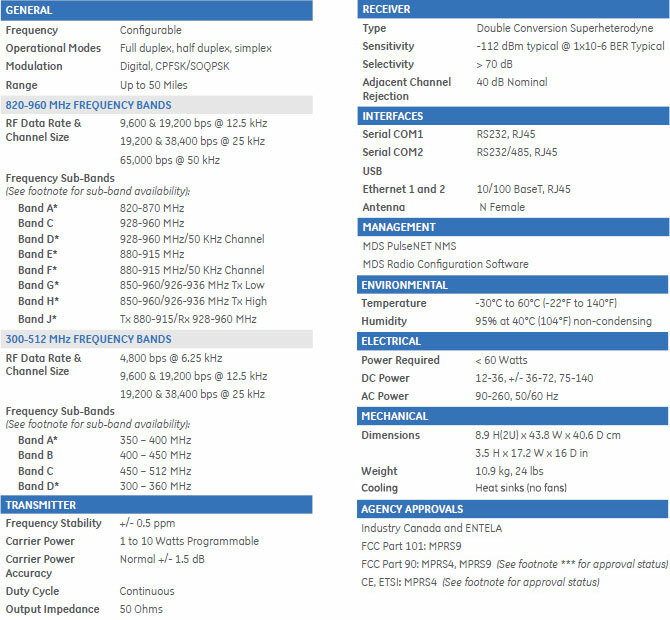 In licensed systems, the Master Station is assigned the primary transmit frequency that is used to communicate to all remote radios in the network. As such, a failure of the Master Station radio can result in a network wide communication interruption. In a redundant configuration, the MDS Master has two complete full duplex SD Series transceivers and power supplies. In the event of a failure the controlling logic switches to the standby unit. Switchover can occur based upon transceiver error codes, loss of communication over a user configurable time period or loss of power. 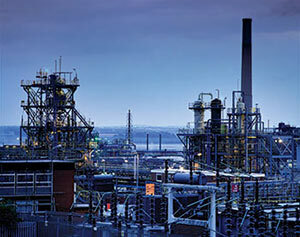 Switchover typically occurs in less than one second. The standby transceiver is constantly operating and its operational readiness can be monitored by the user and external network management systems. For less demanding use cases, the MDS Master Station is also available in a non-redundant configuration. The MDS Master Station is used in a various operational settings depending upon the users specific use case including Master, streaming Repeater or polling Remote. In addition to full duplex, both half duplex and simplex modes are configurable by the user. Typically, the Master Station is located where the primary connection to the user's host system or network is made. In many instances however, clear RF line of sight to remote radio locations cannot be achieved at control centers or host system connection point. In these cases the Master Station can be configured as a streaming Repeater and located at optimal tower sites where line of site can be achieved. An additional Master Station is then configured as a polling Remote. Host system communication is then achieved at the polling Remote through the Repeater to all remote radio locations. 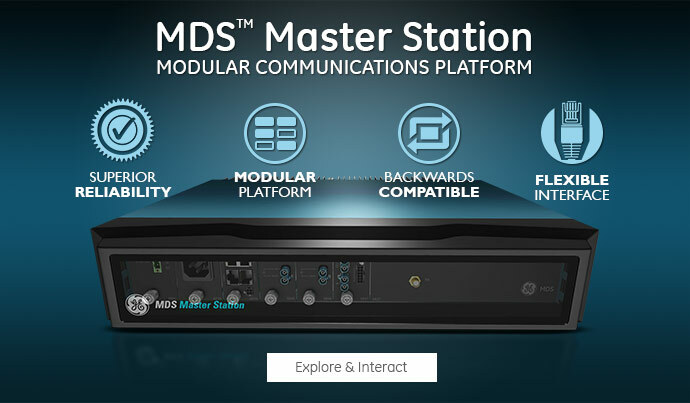 The MDS Master Station can be configured as a Master streaming Repeater and Polling Remote when frequency plans and tower locations and RF line-of-site considerations drive flexibility in enterprise network connections. 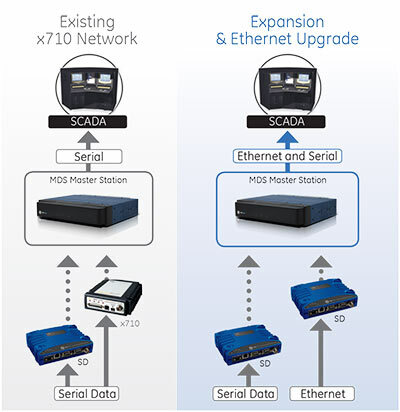 The MDS Master Station features backward compatibility with MDS x790- x710 networks including 2000 and 4000 series. Backward compatibility preserves your investment and provides maximum flexibility for users to migrate from complete x710 radio to hybrid x710 and SD radios ultimately achieving a full SD radio deployment for evolving to enhanced serial and IP/Ethernet functionality. When a full SD network is achieved, users can broadcast switchover to higher modulation and IP/Ethernet services to all remote radios. The Master Station is fully compatible with "B" modem analog x710 radios and supports switched carrier, continuously keyed or key on data operation as well as configurable PTT and CTS delays. Ease of maintenance and serviceability are two additional benefits derived from our modular communications platform. All components in the MDS Master Station are easily accessed from the front panel eliminating the need to remove the chassis should module replacement be required. In addition, redundant transceivers and power supply modules are hot swappable to ensure that the MDS Master Station remains fully operational during service periods after a failover. All power, serial and Ethernet connections are made to the front panel. Antenna and external filter connections are made in the rear of the unit. Check with factory for availability of specific sub-bands. Part 90 approval is pending.